The following is the text from the president’s farewell address this evening. Fellow citizens: For eight years, it has been my honor to serve as your President. The first decade of this new century has been a period of consequence – a time set apart. Tonight, with a thankful heart, I have asked for a final opportunity to share some thoughts on the journey we have traveled together and the future of our Nation. Five days from now, the world will witness the vitality of American democracy. In a tradition dating back to our founding, the presidency will pass to a successor chosen by you, the American people. Standing on the steps of the Capitol will be a man whose story reflects the enduring promise of our land. This is a moment of hope and pride for our whole Nation. And I join all Americans in offering best wishes to President-elect Obama, his wife Michelle, and their two beautiful girls. Tonight I am filled with gratitude – to Vice President Cheney and members of the Administration; to Laura, who brought joy to this house and love to my life; to our wonderful daughters, Barbara and Jenna; to my parents, whose examples have provided strength for a lifetime. And above all, I thank the American people for the trust you have given me. I thank you for …. …the prayers that have lifted my spirits. And I thank you for the countless acts of courage, generosity, and grace that I have witnessed these past eight years. This evening, my thoughts return to the first night I addressed you from this house – September 11, 2001. That morning, terrorists took nearly 3,000 lives in the worst attack on America since Pearl Harbor. I remember standing in the rubble of the World Trade Center three days later, surrounded by rescuers who had been working around the clock. I remember talking to brave souls who charged through smoke-filled corridors at the Pentagon and to husbands and wives whose loved ones became heroes aboard Flight 93. I remember Arlene Howard, who gave me her fallen son’s police shield as a reminder of all that was lost. And I still carry his badge. As the years passed, most Americans were able to return to life much as it had been before Nine-Eleven. But I never did. Every morning, I received a briefing on the threats to our Nation. And I vowed to do everything in my power to keep us safe. Over the past seven years, a new Department of Homeland Security has been created. The military, the intelligence community, and the FBI have been transformed. Our Nation is equipped with new tools to monitor the terrorists’ movements, freeze their finances, and break up their plots. And with strong allies at our side, we have taken the fight to the terrorists and those who support them. Afghanistan has gone from a nation where the Taliban harbored al Qaeda and stoned women in the streets to a young democracy that is fighting terror and encouraging girls to go to school. Iraq has gone from a brutal dictatorship and a sworn enemy of America to an Arab democracy at the heart of the Middle East and a friend of the United States. There is legitimate debate about many of these decisions. But there can be little debate about the results. America has gone more than seven years without another terrorist attack on our soil. This is a tribute to those who toil day and night to keep us safe – law enforcement officers, intelligence analysts, homeland security and diplomatic personnel, and the men and women of the United States Armed Forces. Our Nation is blessed to have citizens who volunteer to defend us in this time of danger. I have cherished meeting these selfless patriots and their families. America owes you a debt of gratitude. And to all our men and women in uniform listening tonight: There has been no higher honor than serving as your Commander in Chief. The battles waged by our troops are part of a broader struggle between two dramatically different systems. Under one, a small band of fanatics demands total obedience to an oppressive ideology, condemns women to subservience, and marks unbelievers for murder. The other system is based on the conviction that freedom is the universal gift of Almighty God and that liberty and justice light the path to peace. This is the belief that gave birth to our Nation. And in the long run, advancing this belief is the only practical way to protect our citizens. When people live in freedom, they do not willingly choose leaders who pursue campaigns of terror. When people have hope in the future, they will not cede their lives to violence and extremism. So around the world, America is promoting human liberty, human rights, and human dignity. We are standing with dissidents and young democracies, providing AIDS medicine to bring dying patients back to life, and sparing mothers and babies from malaria. And this great republic born alone in liberty is leading the world toward a new age when freedom belongs to all nations. For eight years, we have also strived to expand opportunity and hope here at home. Across our country, students are rising to meet higher standards in public schools. A new Medicare prescription drug benefit is bringing peace of mind to seniors and the disabled. Every taxpayer pays lower income taxes. The addicted and suffering are finding new hope through faith-based programs. Vulnerable human life is better protected. Funding for our veterans has nearly doubled. America’s air, water, and lands are measurably cleaner. And the Federal bench includes wise new members like Justice Sam Alito and Chief Justice John Roberts. When challenges to our prosperity emerged, we rose to meet them. Facing the prospect of a financial collapse, we took decisive measures to safeguard our economy. These are very tough times for hardworking families, but the toll would be far worse if we had not acted. All Americans are in this together. And together, with determination and hard work, we will restore our economy to the path of growth. We will show the world once again the resilience of America’s free enterprise system. Like all who have held this office before me, I have experienced setbacks. There are things I would do differently if given the chance. Yet I have always acted with the best interests of our country in mind. I have followed my conscience and done what I thought was right. You may not agree with some tough decisions I have made. But I hope you can agree that I was willing to make the tough decisions. While our Nation is safer than it was seven years ago, the gravest threat to our people remains another terrorist attack. Our enemies are patient and determined to strike again. America did nothing to seek or deserve this conflict. But we have been given solemn responsibilities, and we must meet them. We must resist complacency. We must keep our resolve. And we must never let down our guard. As we address these challenges – and others we cannot foresee tonight – America must maintain our moral clarity. I have often spoken to you about good and evil. This has made some uncomfortable. But good and evil are present in this world, and between the two there can be no compromise. Murdering the innocent to advance an ideology is wrong every time, everywhere. Freeing people from oppression and despair is eternally right. This Nation must continue to speak out for justice and truth. We must always be willing to act in their defense and to advance the cause of peace. President Thomas Jefferson once wrote, “I like the dreams of the future better than the history of the past.” As I leave the house he occupied two centuries ago, I share that optimism. America is a young country, full of vitality, constantly growing and renewing itself. And even in the toughest times, we lift our eyes to the broad horizon ahead. I have confidence in the promise of America because I know the character of our people. This is a Nation that inspires immigrants to risk everything for the dream of freedom. This is a Nation where citizens show calm in times of danger and compassion in the face of suffering. We see examples of America’s character all around us. And Laura and I have invited some of them to join us in the White House this evening. We see America’s character in Dr. Tony Recasner, a principal who opened a new charter school from the ruins of Hurricane Katrina. We see it in Julio Medina, a former inmate who leads a faith-based program to help prisoners returning to society. We see it in Staff Sergeant Aubrey McDade, who charged into an ambush in Iraq and rescued three of his fellow Marines. We see America’s character in Bill Krissoff, a surgeon from California. His son Nathan, a Marine, gave his life in Iraq. When I met Dr. Krissoff and his family, he delivered some surprising news: He told me he wanted to join the Navy Medical Corps in honor of his son. This good man was 60 years old – 18 years above the age limit. But his petition for a waiver was granted, and for the past year he has trained in battlefield medicine. Lieutenant Commander Krissoff could not be here tonight, because he will soon deploy to Iraq, where he will help save America’s wounded warriors and uphold the legacy of his fallen son. In citizens like these, we see the best of our country – resilient and hopeful, caring and strong. These virtues give me an unshakable faith in America. We have faced danger and trial, and there is more ahead. But with the courage of our people and confidence in our ideals, this great Nation will never tire … never falter … and never fail. It has been the privilege of a lifetime to serve as your President. There have been good days and tough days. But every day I have been inspired by the greatness of our country and uplifted by the goodness of our people. I have been blessed to represent this Nation we love. And I will always be honored to carry a title that means more to me than any other: citizen of the United States of America. Remember the Cheney secret meetings with energy executives? President George W. Bush is first class, all the way. His successor has some pretty big shoes to fill. 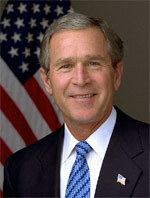 Thank President Bush for all your hard work.